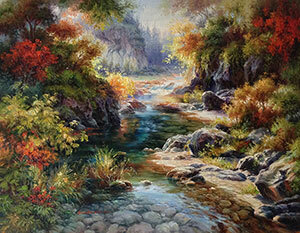 Kim shows his love of landscapes vividly through his artwork. 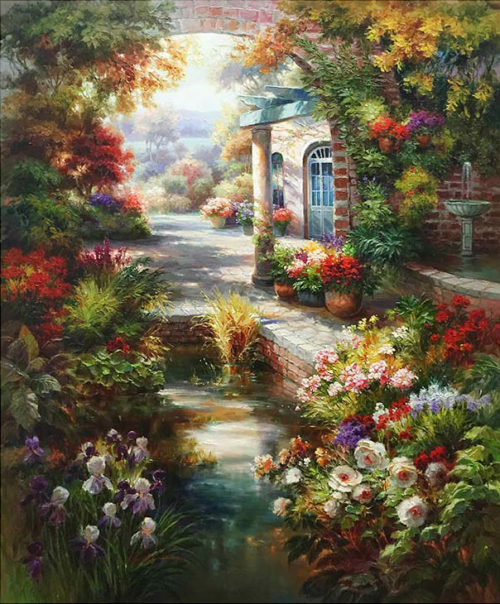 He has developed his painting style to express his love of European landscaping, especially the Mediterranean Sea and English gardens. 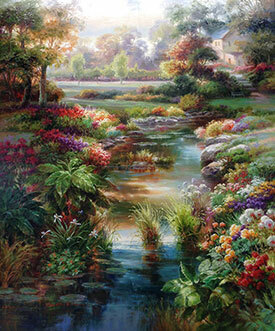 He expresses lifelike landscapes through impressionistic styles with a combination of strong and soft brushstrokes. Dae Chun Kim’s paintings are popularized by his delightful and vibrant choice of colors and incredible use of light and shadow. He brings out the sense of peace in his landscapes and a cozy warm feeling in his French and Italian street scenes. 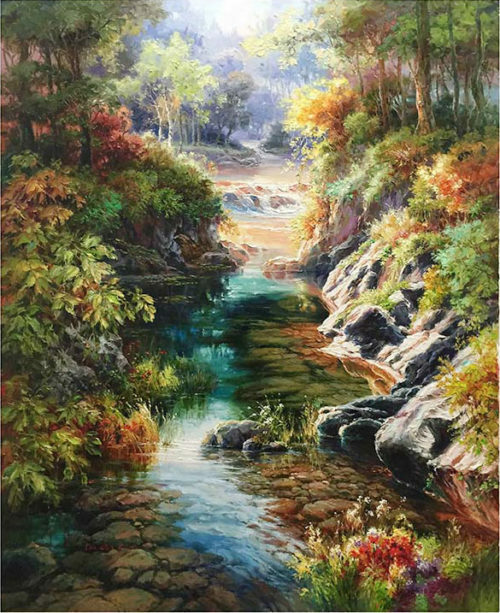 One notices the appreciation of life and nature Kim instills unto his paintings. Dae-Chun Kim was born in 1954 in Pusan, Korea and graduated from Hong-Ik University, with a degree in fine arts. While attending college in 1974, he won an award in an art competition that was hosted by “Jogye Order of Korean Buddhism” in DukSu Palace. That event drove the motivation for him to become a great artist. In 1975, he became recognized as a famous artist in Korea when his collection, “The life of Sakyamuni” was published in the Buddhism Newspaper. 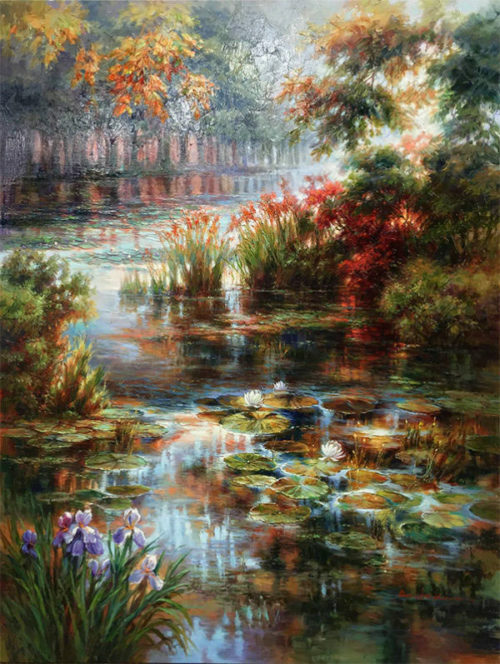 As a student, Kim’s love of art grew as he studied the techniques of many impressionistic styles from around the world. After Dae Chun Kim graduated from college in 1976, he received third place in the Gusang Art Exhibition. He was awarded the great honor of first place from the Buddhism Art Exhibition at the Hyundai Art Gallery in Seoul. After graduation, Kim pursued his dream of becoming a professional artist. Like many great artists, he traveled in search of inspiration and the perfect subject, leading to the United States, Mexico, Japan, England, Italy, and France. Kim doesn’t limit himself just to one landscape; he also paints old buildings rich with flowers with the Mediterranean Sea in the background. He especially likes to paint the “Colmar” street alleys and “Aix Provence” from France. In his 30 years of painting Dae Chun Kim has accumulated numerous accolades. His work has been displayed in a countless number of exhibitions including Hyundai Art Gallery in Korea, Gallery Birmingham in London, Mokwoo Artist Festival, Gusang Art Festival, the Didimdol Artist Association, exhibition at Seoul Art Center, Fine Art Pavilion at Atlanta Art-Expo, and International Art-Expo New York. His work is highly sought after and can currently be found in select galleries throughout the world.